Paul Newman's famous blue eyes glint even in the stark black-and-white photography of Robert Rossen's morality tale with no clear moral, providing one of the film's few points of light. In time, even they fade under the weight of the darkness around them. Bringing to life a character first seen in Walter Tevis' novel, Newman plays "Fast Eddie" Felson, a pool ace with a single goal: to beat the legendary Minnesota Fats (Jackie Gleason) at his own game. He has the skills to do it, too, but over the course of the film he learns that skills alone aren't enough to make it to the top. Sometimes you have to leave a little of your soul on the table, too. Throughout the first two decades of his career, Newman alternated between smooth-talking pretty-boy roles and parts where he played troubled rogues, likable but dangerous. Newman received his third Best Actor Oscar nomination for Hud, in which he plays a rancher's son who spends his days sexually harassing the family housekeeper while waiting for his dad to die so that he can claim his inheritance. And yet, even though the character is a total prick, Newman is strangely sympathetic, because he makes a life of drinking, roping, and not giving a damn look wholly defensible. The Newman in Cool Hand Luke isn't as chatty as the one of Hud, but under different circumstances, the surly egomaniac of Hud might have become the restless rebel of Luke. Newman won the hearts of the counterculture—and garnered his fourth Best Actor Oscar nomination—playing a devil-may-care dude who's arrested for a silly crime and sent to work on a chain gang, where he spends his days charming his fellow cons while concocting clever escapes. Cool Hand Luke's plot is pure allegory, but the character is fully human. He's funny, quietly cocky, and he can eat 50 eggs. With one foot planted in the world of traditional Westerns and the other in the playful, French New Wave-inspired new Hollywood ushered in by Bonnie And Clyde, Butch Cassidy And The Sundance Kid had a little something for everyone. The first film to pair Newman with co-star and lifelong friend Robert Redford and with director George Roy Hill, it lets the stars irreverently goof their way through Old West adventures that glow with a sad romance. The leading men radiate youthful exuberance, but Hill and screenwriter William Goldman shot the film with nostalgia for ways of making movies and methods of seeing the past that were on their way out. Newman's growling, laconic presence elevates this collection of tall tales about Judge Roy Bean, "The Law West Of The Pecos," into oddball comic art. Directed by John Huston from a script by John Milius, the film cobbles together assorted legends about the 19th-century saloon owner who required petitioners to buy drinks during recesses and could find no law against killing a Chinaman in his tattered copy of the Revised Statutes Of Texas. Newman underplays to the point of catatonia next to Stacy Keach (as the original Bad Bob—the albino), Anthony Perkins (as a preacher), and Ava Gardner (as Bean's object of adoration, the actress Lily Langtry). Released between Butch Cassidy and The Sting, at the pinnacle of Newman's box office prowess, it's a quirky, quotable testament to Newman's lack of concern for his star image. Newman re-teamed with Robert Redford and director George Roy Hill for The Sting, an ingeniously plotted trifle that put Newman's matinee idol looks and anarchic streak to good use playing a lovably dissolute grifter who teams up with fellow looker Redford to pull the ultimate con on nefarious bad guy Robert Shaw. Newman and Redford seduce the audience as well as their marks with their all-American charm and dazzling charisma, elevating a pleasant piece of fluff into something timeless and resonant. The Academy-anointed Best Picture of 1973, The Sting is featherweight entertainment lifted to the lofty realm of art. Unlike some of his contemporaries who came up in the waning days of the studio system, Newman fit perfectly into the "New Hollywood" of the '70s, with its maverick directors and franker content. It's unfortunate that Newman never made a really good film with his friend Robert Altman—although Buffalo Bill And The Indians has its moments—but Newman did get to shine in one of the shaggy, profane comedies that emerged in the wake of Altman's M*A*S*H. In Slap Shot, Newman plays the coach/star of a minor-league hockey team, who realizes he can pack the stands if he gives fans the violence and vulgarity they now regularly demand. The "life imitates art" ironies certainly weren't lost on director George Roy Hill, but that didn't stop him from making the movie's own profane content hugely entertaining. It helped that he had a winning lead in Newman, who even at his most foul-mouthed seems like maybe the only decent man left on the ice. For a movie star of his caliber, Newman often had a retiring disposition on screen, which indicates either his natural reticence or a quiet confidence that needed no emphasis. In The Verdict, he plays a gifted attorney who's all too willing to retreat back into his shell rather than confront the man he's become—an ambulance-chasing bottom-feeder with a drinking problem. But something about a medical malpractice suit stirs his dormant conscience; instead of going for the easy settlement for his clients, he summons extraordinary courage and takes the case to court. Working from a David Mamet screenplay—and with the great actor's director Sidney Lumet behind the camera—Newman gives a great slow-burn of a performance as he takes on a justice system that's stacked heavily against him. Newman won his only Oscar—out of 10 nominations!—in his return as "Fast Eddie" Felson in Martin Scorsese's follow-up to The Hustler, and while it was largely considered a make-up Oscar at the time, he still deserved it. Picking up two decades after the first film left off, Scorsese and ace screenwriter Richard Price had just the right conception of Felson as a guy who still knows all the angles, but has the wisdom and humility to suppress his ego if it means getting the big score down the line. He sees himself in lunk-headed young pool prodigy Tom Cruise, who never seems to understand that sometimes when you lose, you win and sometimes when you win, you lose. His fatherly attitude toward the younger man is simultaneously exploitative and genuine, yet ultimately sad and self-defeating. Like a lot of Scorsese protagonists, he's doomed to be a lonely man, the sort of guy who once brushed elbows with Minnesota Fats—and displayed flashes of genius against him, too—but never escaped those musty pool halls. Late in his career, Newman slowed down considerably, working mainly in supporting roles where he barely had to speak. (Which isn't that big a deal, since a grunt and a squint from Newman could say more than a monologue.) Though the 1996 neo-noir Twilight is a fine film, and the TV movie Empire Falls quite good as well, Newman's last great leading-man role (and his last Best Actor Oscar nomination) came in Nobody's Fool, Robert Benton's low-key adaptation of Richard Russo's novel about an aging small-town ne'er-do-well trying to reconcile with the son he abandoned. Tender, funny, and uplifting, Nobody's Fool gets an added boost from the memory of Newman in movies like The Hustler, Hud, and Cool Hand Luke, where he made choices solely for his own benefit. 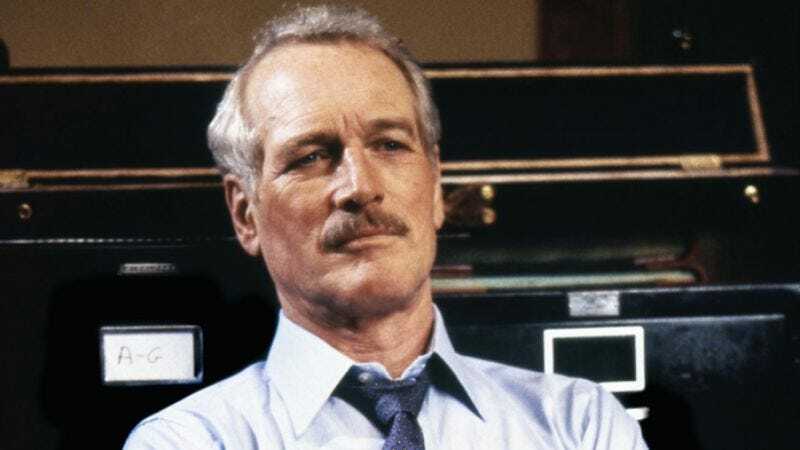 In Nobody's Fool, Newman's character pays the price for a life of selfishness, yet because he's Paul Newman, he's ultimately granted sweet mercy.